I've Got the Blues (and I Love it). 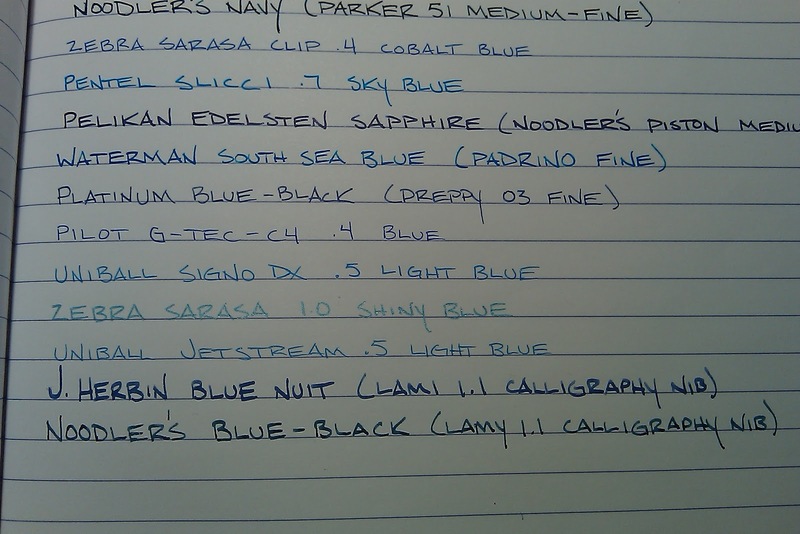 Blue, for now, is the most common color that I have in the inks and pens I own. It is one of the few colors that I can use in a professional setting, and I often select a variation of blue depending on my mood. 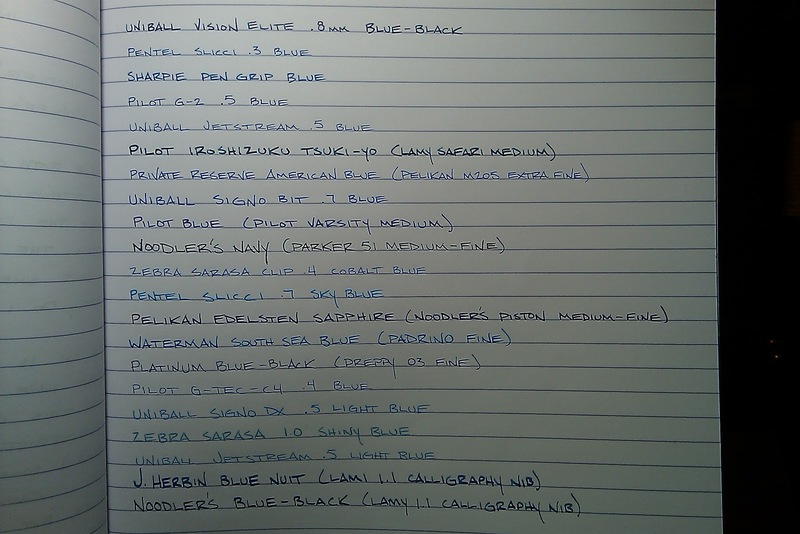 I will be doing reviews of some of these pens/ink individually, but I wanted to get this posting up to show how great these colors are. 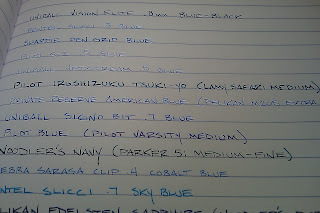 One surprising finding was that the Uniball Vision Elite Blue-Black was remarkably close to the Pilot Iroshizuku Tsuki-yo. The Uniball even had similar shading, which is far less common in rollerballs. Some of blues look way different than I expect them to when they are compared side by side. 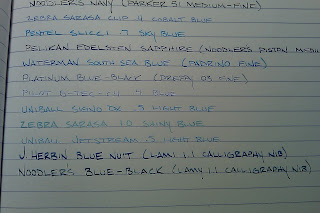 For brighter blues, the Waterman South Sea Blue and the Pentel Slicci .7 Sky Blue are really fantastic. 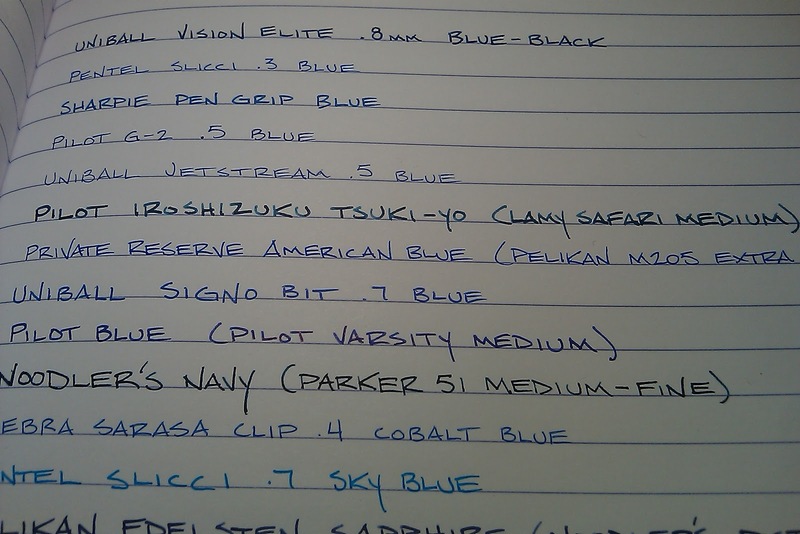 For darker blues, I love the Sharpie Pen Grip Blue, the Pilot Blue (Pilot Varsity), and the Private Reserve American Blue. 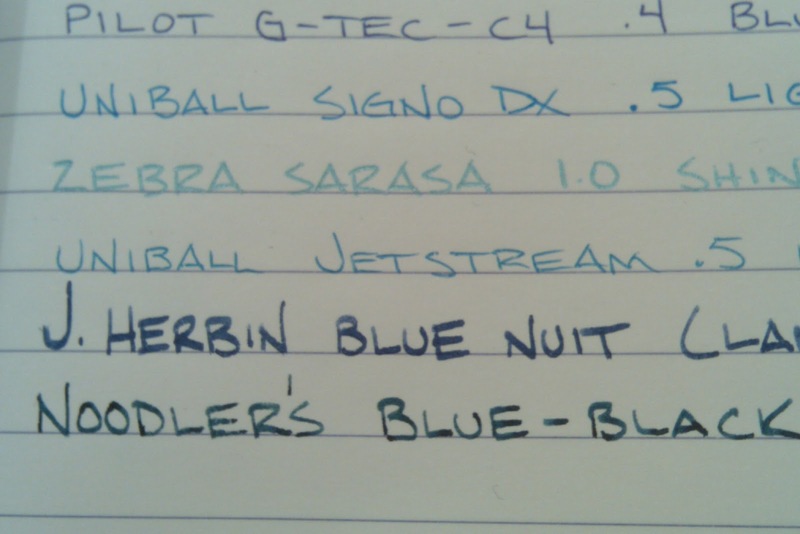 I was not as big a fan of the Zebra Sarasa 1.0 Shiny Blue or the Uniball Jetstream Light Blue (I prefer the regular Jetstream Blue). 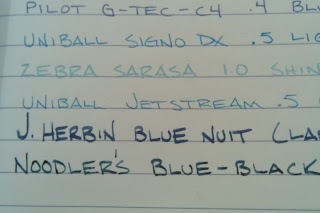 The Noodler's Blue-Black was also quite similar to Iroshizuku Tsuki-yo and the Uniball Vision Blue-Black. So, what are your favorite blues? 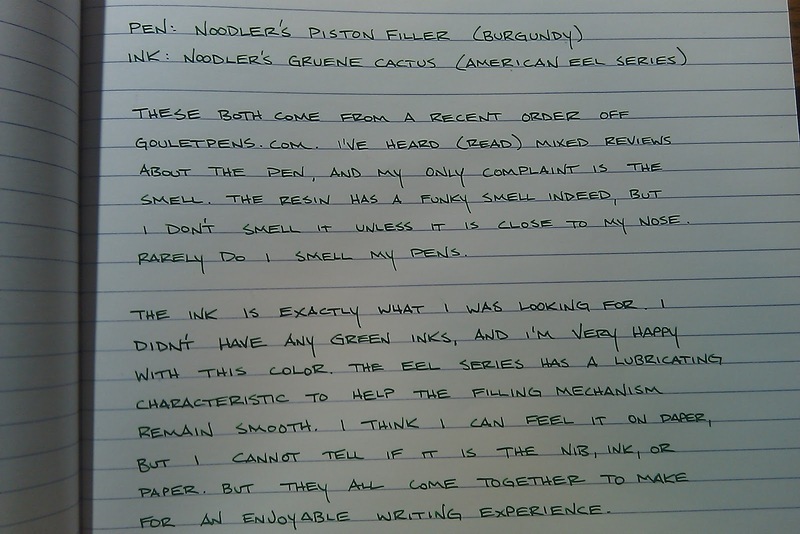 As always, the Noodler's ink comes filled to the brim. My girlfriend wanted to make sure this bottle hadn't frozen in the mailbox, so she opened it up and nearly repainted our counter-top green - or "gruene," as it were. I did not mean to get this sort of shimmer off the clip, but at least it wasn't rendered in Adobe Photoshop. 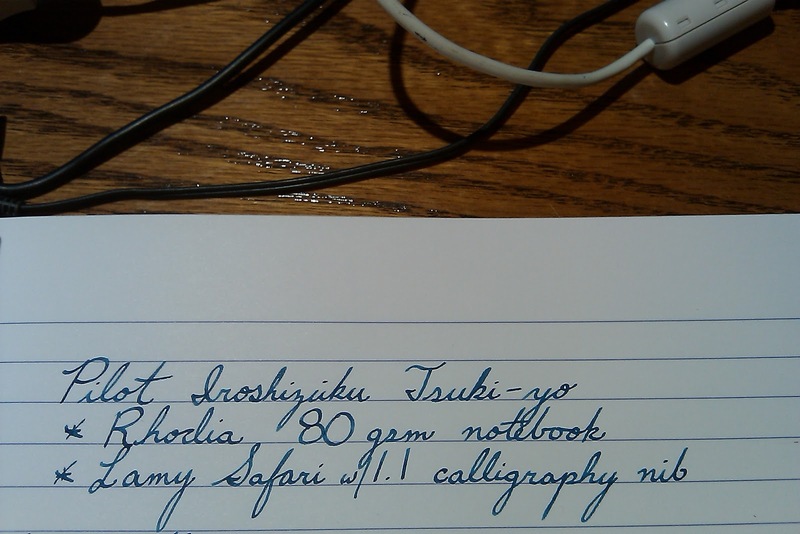 I have to say I love the combination going on here: Rhodia paper, an excellent Noodler's ink, and a very nice economy-level pen. 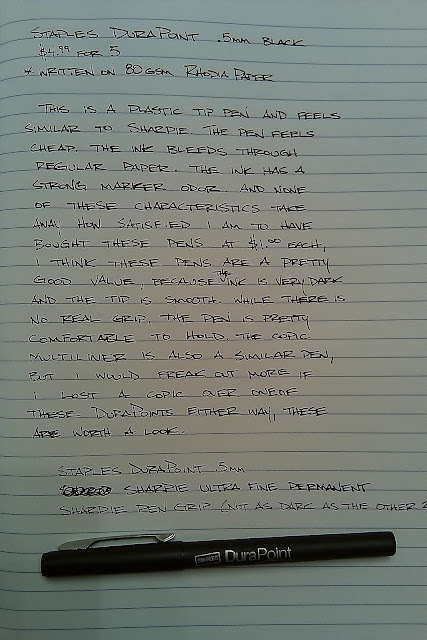 As I note in the review, the pen does smell, but I can overlook it for the price it lists at. 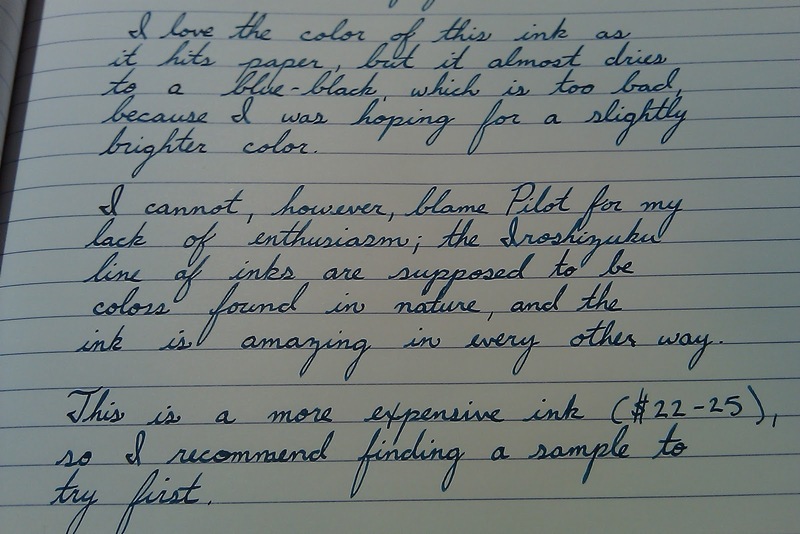 The review makes the ink appear almost black, which it is not. The color is quite green, but it can appear pretty dark at times. I hope you can see the color variation. At times, the color is nearly a green-black. Sometimes the color is almost approaches a lime green. The ink takes forever to dry, but I don't write quick enough to worry about smearing the ink with rapid turning of the pages. 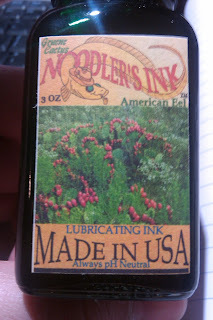 I am very happy with these offerings from Noodler's. 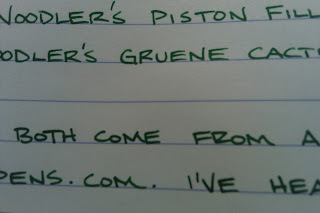 I received my order very quickly from Goulet Pens, which cost about $3.50 in shipping. They have a lot of great inks and paper, so I will certainly be doing more orders in the future (no affiliation whatsoever). 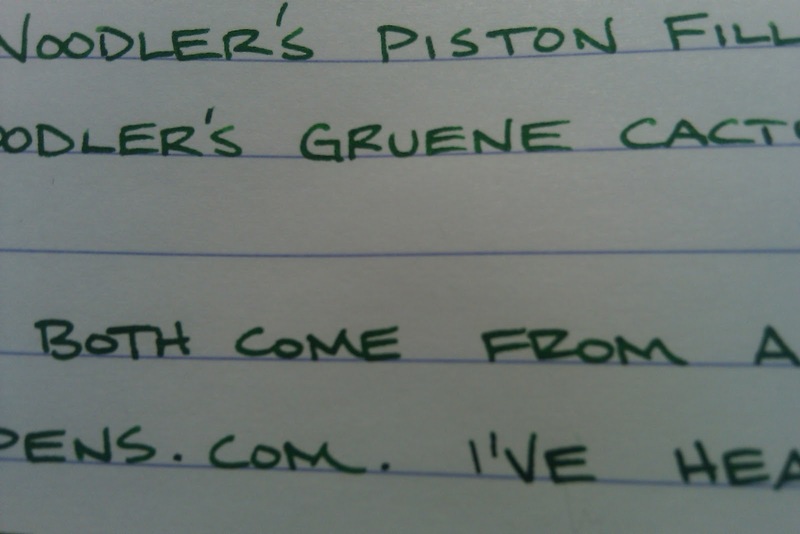 I tested this ink in my trusty Rhodia staple-bound notebook using my equally trusty Lamy Safari (fitted with a 1.1mm calligraphy nib). Don't let my perspective on the ink color deter you from trying this ink. 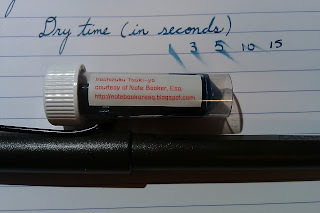 I just wanted something a lighter/bluer, and this ink cannot be held accountable for my expectations. After trying this color, I am more than eager to pick up some other colors, even with the hefty price tag. 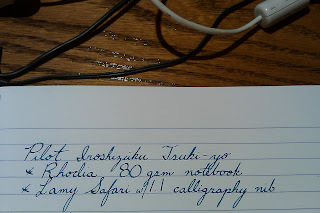 As you can see in the image below, the try time was pretty substantial, but a big part of this is the Rhodia paper which, though not very porous, allows for excellent shading in most of the inks I have used. A special thanks to Note Booker, Esq. for sending over the ink sample. 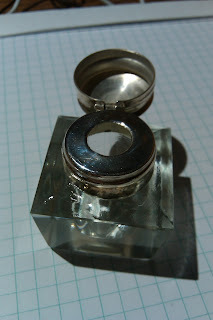 I still have two more samples that he sent to try, so those will be coming up in the next few weeks, too. 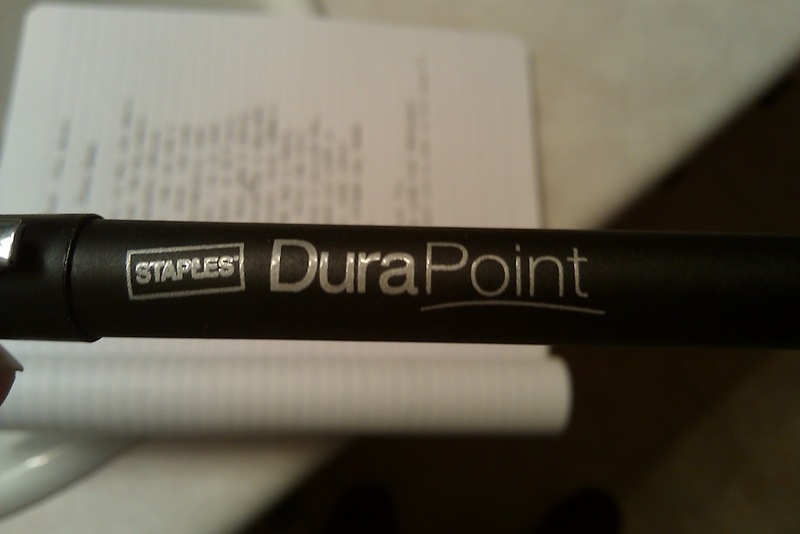 This is the new Staples DuraPoint that I first heard about from The Pen Addict. 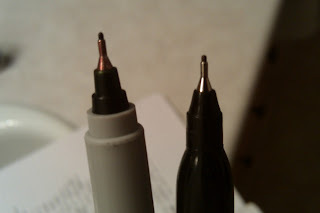 These are very similar to a Sharpie Ultra Fine, and the comparison is a good thing. (Important: see update at the bottom of the review. My opinion of this pen has changed.) I noted that there is a strong marker smell. The pen feels cheap. 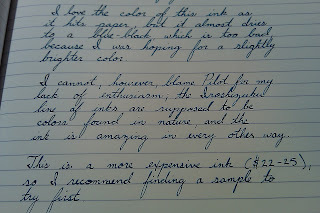 The ink bleeds through, even on Rhodia paper. And I would still recommend this pen because they come in at $1.00 (U.S.), which is great considering the ink is bold, the tip writes smoothly, and the performance, for the most part, is pretty good. 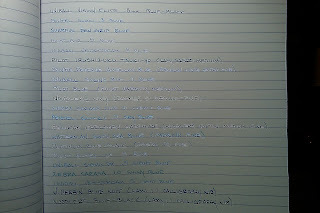 I think this pen is going to be a love-it-or-hate-it type pen. I have noticed that the end might start off dry, so the point might have to be primed a bit. Overall, worth trying. I still prefer the Sharpie, but I like to see the big stores trying new things, too. 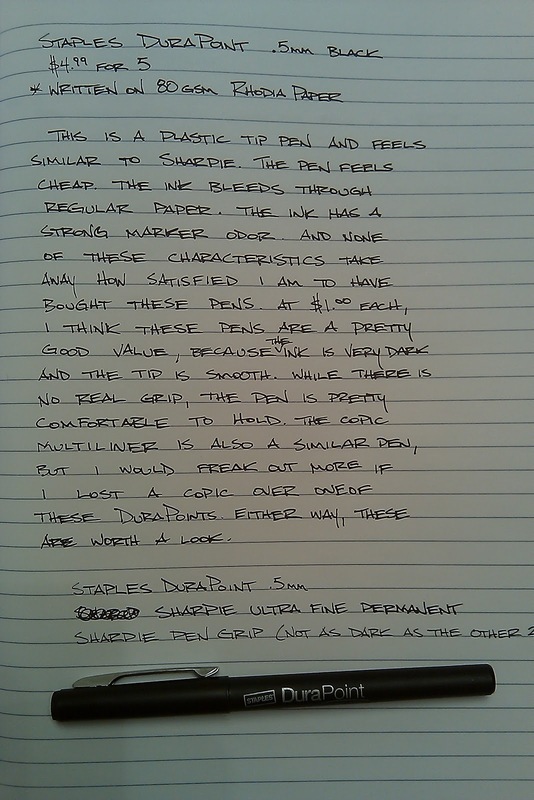 On the bottom of this writing sample, you can see how the color compares between a Staples DuraPoint, a Sharpie Ultra Fine Permanent, and a Sharpie Pen Grip. 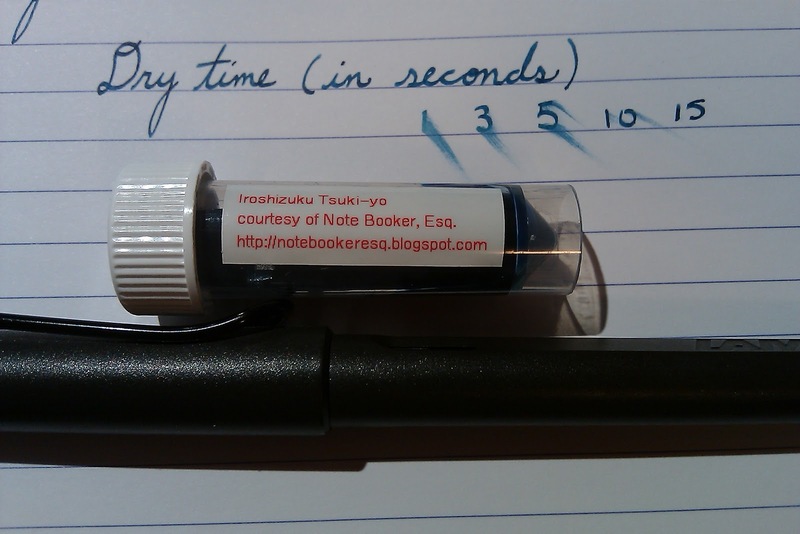 If I could get a Sharpie Pen Grip with a needle point and the $1.00 price, I would be a very happy pen geek. ** One week of use update: After trying this pen over the course of a week, I have noticed that the pen has a difficult time writing when first uncapped. I didn't have this problem initially, so I have to say that this is characteristic takes the pen down quite a few notches. After having some more time with this pen, I'd recommend sticking with a Sharpie. 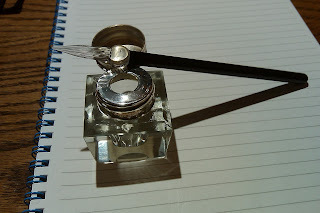 Be sure to head over to Pocket Blonde to check out the January, 2011 Carnival of Pen, Pencil, & Paper. There is a huge list of reviews to check out, and I doubt anyone will be disappointed with the selection. Enjoy! It seems pretty rare that our office supplies and writing instruments involve glass, except for, perhaps, bottles of fountain pen ink. Prior to the convenience of filling mechanisms, cartridges, and disposable pens, people primarily relied on pencils, dip pens, and inkwells. 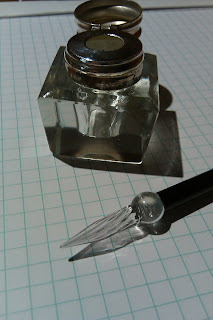 I purchased this J. Herbin glass dip pen from JetPens, and it is not only visually striking, but it brings a warming sense of nostalgia to mind. 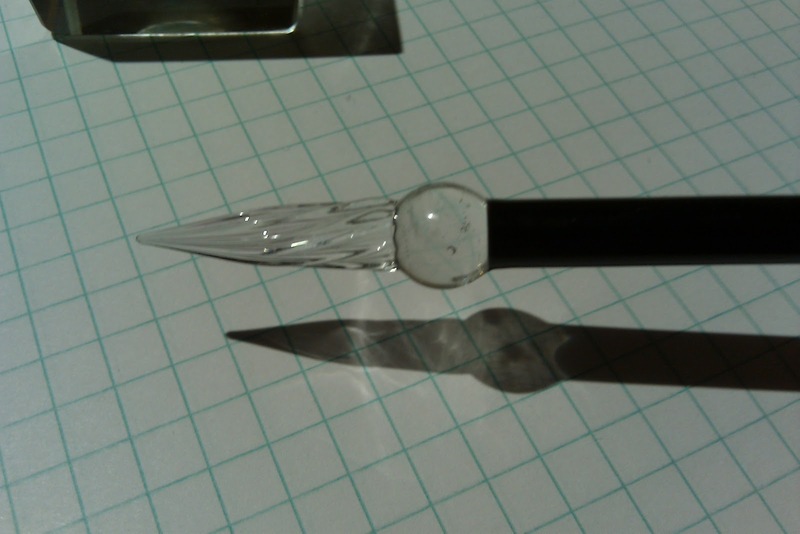 According to the packaging, glass dip pens were rather popular in the 17th century Italy, and J. Herbin, founded in 1670, has been producing ink, wax seals, and a variety of other products since this innovative instrument first became a fad. 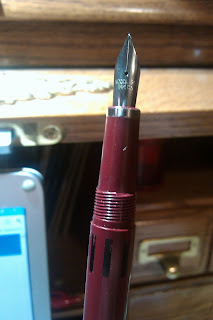 The fad has been revived, and I've heard good things about this handmade pens. 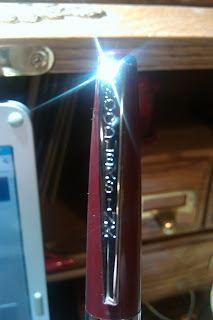 The pen itself has a nice weight, and the nib section has spiral glass flutes that hold ink, enough for several lines. I will be doing a review of the performance in my next post. I was gifted this antique inkwell for Christmas, and I thought the pairing of the two was a nice pairing of materials and contrast of style. The inkwell is more Art Deco than anything else, and may have been produced in between the 30s and 50s. I like how these two items look together - classy, functional, and stylish. 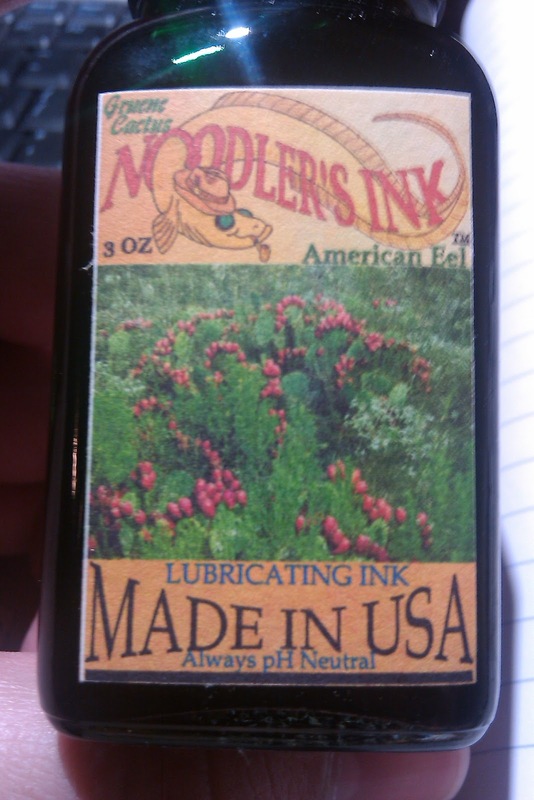 I have yet to commit myself to putting an ink in the inkwell, because it seems easier to just draw from the bottles of ink, but I might dump some ink samples in the inkwell. Many samples come in small plastic vials, and I'd obviously rather not have one tip over and pour ink over the stuff on my desk. Let me know if you've had any experience working with a glass dip pen or inkwell. 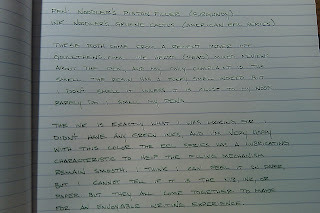 If you acquire ink samples, how to you typically try them out - dip pen, eyedropper, cotton swab?